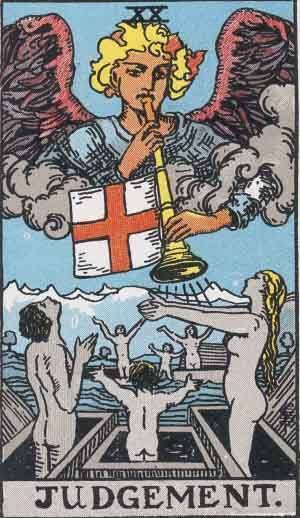 The Judgement tarot card is the 20th Major Arcana card. The imagery is clear, it is the day of judgement. The dead are rising to have their lives judged on the day of resurrection, complete with the Christian symbology of Gabriel’s horn. The Judgement tarot card signifies decision and the outcome of choice. Past – Judgement in the Past position means there might have been an event in the past where you have jumped to conclusions, and whatever the outcome, it is still affecting you now. It could have been an emotional outburst that was unwarranted. It may also mean that everything you’ve done to work up to this point is going to be forgotten. This isn’t always a bad thing; you are closing that chapter of your life and turning over anew leaf. Present – Judgement in the present position means that you may be called to talk about your actions soon. Have you been acting in secret? People may know. Likewise, you may know someone has been trying to keep something hidden and now is the time to approach them about it. If it feels like you’re doing something wrong in regards to a person, own up to it before they find it out. Future – Judgement in the future position mean that the choices you’ve made now are going to have a noticeable effect on the future. Even the smallest decision can affect the future in more ways than we will ever know. It’s also the choices we don’t make that can matter. Remember not to put off or procrastinate in the mean time. Judgement day can come at any time, so you have to keep true to yourself until it does. Work / Education – Judgement in regards to work or education reminds you not to put off tasks until the night before. Plan your week and achieve balance. if you have an inspection at work or a test at school, take care with it. Be sure you don’t make any silly mistakes because of nerves. Find out as much as you can, talking to others who have been through the same thing will help, even if you aren’t nervous. Romance – Judgement in romance might mean that a deal breaker scenario is coming up. Your partner might get a new job somewhere else and ask you to come with them, or something even more difficult will show itself. You might learn something new about your partners past that hasn’t come to light for whatever reason. Likewise, if you’ve been keeping anything from your partner, be sure that it will eventually surface itself. You shouldn’t hide anything from your partner. Friends – Judgement in regards to friendship means you shouldn’t jump to conclusions when you find out how a friend has acted. They might not have been themselves, but they also may have. Take their character into account when thinking about confronting them. Do you need this person in your life? If you’re looking for new friends, go outside your comfort zone, into new interests and groups. Join a taster session. The key is to meet people from a new background. Money – Judgement in regards to finances is generally a good sign, if you’ve been keeping track of your money. just be cautious generally and make sensible purchases. If you’ve run into a rut in regards to money, look where it’s being spent. Is there anything unaccounted for? Health – Judgement reminds you to let go of the past mentally. You might have been different when you were growing up. Don’t let it define you now. Physically, things should be either okay or on the upswing. Don’t expect a sudden illness, and don’t go overboard. A little treat, maybe a bit more than you usually do though, is fine now. Spirituality and Mentality – Judgement in spirituality means you should be open and honest now. Try new things and get some new experiences in. If you’ve had a preconception of something, now is the time to challenge it. In reverse, Judgement calls for you to look within yourself. Often, we live our lives without introspection, and it can take somebody else to look at us and help us see where we are going wrong. It can help to practice this yourself. Sometimes, you know you are doing something morally wrong, but you ignore it. In the long run, this will not benefit anybody, especially you. To grow as a person, you need to account for your infractions on the universe. Judge yourself before others. None of us can act as the bastion for the moral right, but we can keep improving ourselves, and keep helping others to improve. As a Yes or No question: Yes. But you should also trust your instinct. We’ve selected live tarot readers to give you a FREE 3 Minute interpretation of the Judgement Tarot Card! Scroll through them below and pick your favorite one.